"House, dog, baby" goes the adage and we fit right in. No sooner had we moved into our first home than we became owners of our first dog, an English Springer Spaniel. 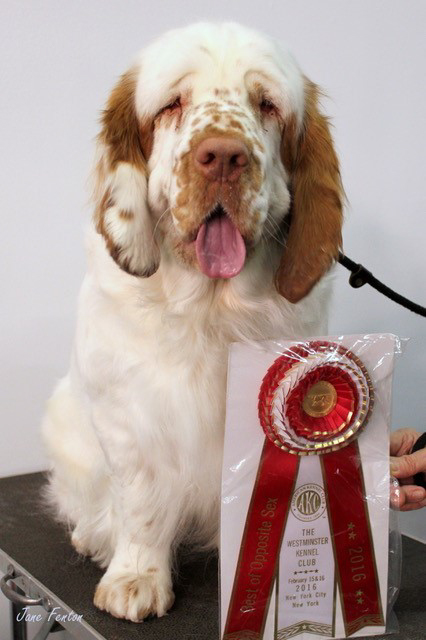 So enthusiastic were we that annual trips to Westminster and American Spaniel Club be-came highly anticipated events. Sadly, we lost our Springer at a young age, but through conversations at shows, we ended up an-other sporting spaniel breed. We had English Cocker Spaniels for twenty years while our children were growing up. Once our children went off to college, we resumed attending shows. New conversations introduced us to gentle white dogs called Clumber Spaniels. Before long we became the proud owners of one of these relatively rare spaniels. There are less than 200 Clumber Spaniels registered in a given year… compared to Labrador Retrievers which count 140,000. Our first Clumber, Zoe, was a lovely girl who’s breeding and show prospects were cut short when her teeth were not in alignment according to the Breed Standard. Soon we decided we wanted a Clumber who could be part of a breeding program and the show world. Lugging gear and dogs, poop patrolling and an array of other associated tasks became our weekend pleasures. Based on years of looking at Clumbers, we chose "Plum" as our first show girl. Armed with carefully heeded advice from her breeder, and in spite of the big learning curve on our end, we showed Plum to her championship. Subsequently, Plum produced two litters. Currently she is the grand-dam of our household. She is great-grandmother to the fourth generation under our roof who were born on her eleventh birthday in the fall of 2016. 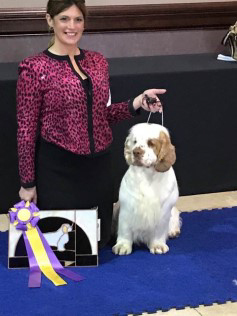 Plum's grand-daughter, GCH Beachwalk Knickers in a Twist, "Pip", won Best in Specialty Show at the 2017 Clumber Spaniel Club of America Specialty - a breeder's dream. It is often not well understood by the general public and most veterinarians what all this dog show stuff is about. The fleeting moments on television in February do not tell an accurate story of what it takes to appear on that screen. That televised narrative speaks to the stuff of beauty pageants and arbitrary ‘likes’. The true purpose of dog shows is first and foremost to assess breeding stock. It requires a keen eye and solid choice making. Dog shows are how judges and those in the audience can evaluate each dog according to its Breed Standard. These standards are developed over time by life-long students of each breed. By understanding the standard, the judge conjures an ideal mental image of each breed and carries it in their mind’s eye while evaluating the entry presented on a given day. For breeders it is the all important opportunity to see how their progeny compares to others in that breed. The larger the entries in which one competes, the more valuable the experience enabling sound choice making for future generations. Volunteer activities are at the heart of supporting all purebred dogs whether a show dog or a family companion. 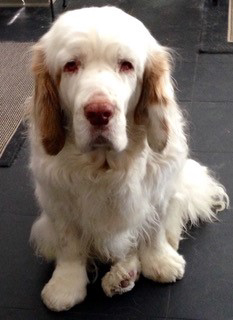 We have been active in the Clumber Spaniel Club of America for 12 years. 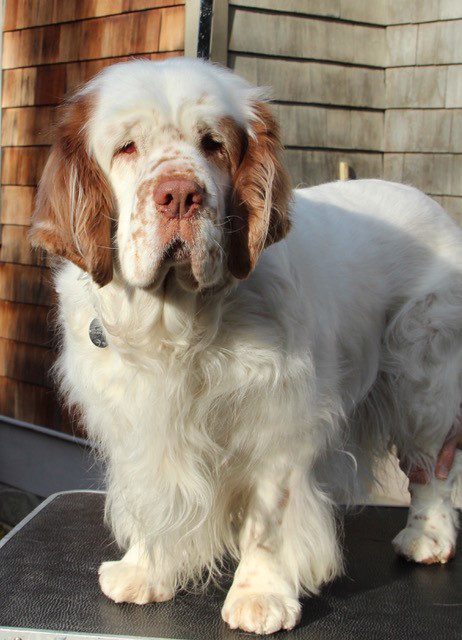 In that time, I have served as a CSCA Board member, Vice-President, chair and developer of the Clumber Closet, oversaw the CSCA website, designed and produced the Yearbook, mounted the Clumber Spaniel booth at the annual Meet the Breed in New York City and many other things "Clumber". Beachwalk Clumber Spaniels came about from love for the breed…and those wonderful beach walks we had with our very first girl.